In the wake of Intel's announcement of their upcoming Skylake-X and Kaby Lake-X processors, GIGABYTE has unveiled their lineup of X299 LGA2066 motherboards. 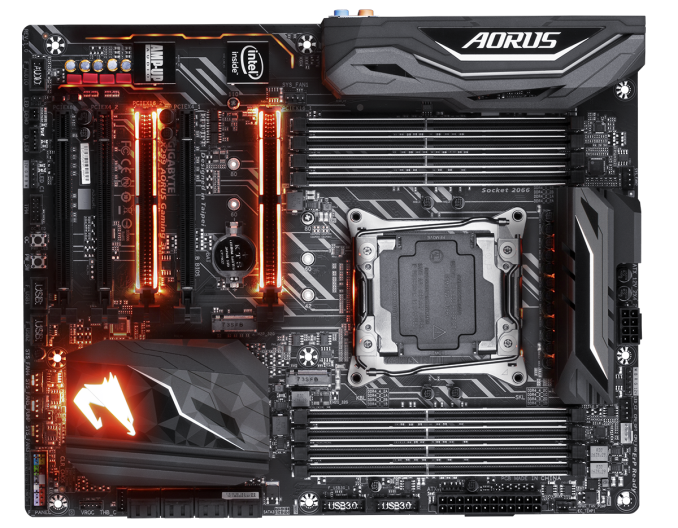 Given the fact that this is a high-end platform, GIGABYTE has opted to use their premium AORUS brand for all three initial models, which are the X299 AORUS Gaming 9, X299 AORUS Gaming 7, and X299 AORUS Gaming 3. Starting off with the flagship X299 AORUS Gaming 9, we get to see GIGABYTE's unconstrained vision for this new HEDT platform. 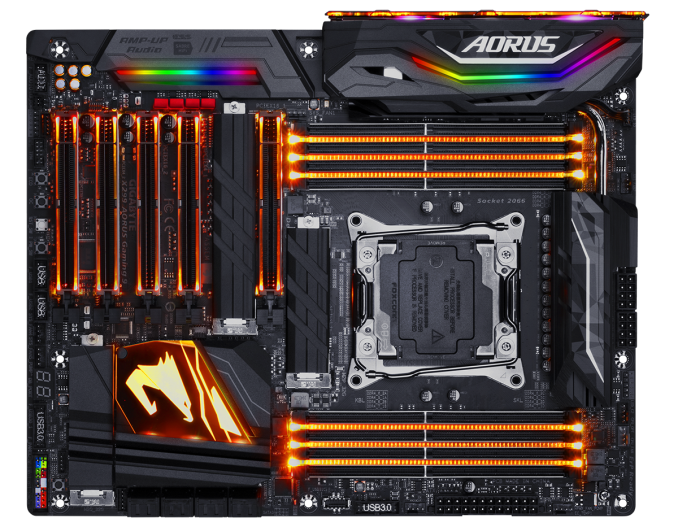 The X299 AORUS Gaming 9 has what appears to be a 12-phase CPU power design, and features Nippon Chemi-Con 10K Durable Black solid capacitors everywhere but in the audio subsystem. There are two 8-pin CPU/EPS power connectors, which should come in handy if a high TDP 18-core Skylake-X processor is installed or just when doing some extreme overclocking. Making full use of this platform numerous PCIe lanes, there are five mechanical PCIe x16 slots, all of which have been mechanically reinforced with steel and additional anchor points for improved retention and shearing resistance. Two of the slots run at x16, one of the slots runs at x8, and the other two are limited to x4, which means that this motherboard will 'only' be able to handle up to three-way graphics card configurations. Storage connectivity appears to be excellent with eight SATA 6Gb/s ports and three M.2 slots that support SATA, PCI-E, NVMe M.2 solid state drives and Intel's new Optane Memory technology. All three slots feature a Thermal Guard cover to help protect and cool the M.2 drives. For those who need a fourth M.2 slot, GIGABYTE have also included an M.2 add-in card in the accessories bundle. If the lack of an U.2 port is a concern, worry not since there is also a M.2 to U.2 adapter included. This motherboard also supports four USB 2.0 ports (two headers), eight USB 3.0 ports (four rear, two headers), and seven USB 3.1 Gen2 ports (five rear, one header). Focusing on the full-speed USB 3.1 Gen2 ports, there are an impressive four Type-A ports and one Type-C port on the rear I/O panel, and a USB 3.1 Gen2 front-panel internal header next to the memory slots. At least some of this USB 3.1 Gen2 connectivity is courtesy of the brand new ASMedia 3142 controller. When it comes to networking, there are two gigabit LAN ports, one powered by an Intel controller and one by a Rivet Networks Killer E2500 chip. The onboard dual-band 802.11ac Wi-Fi is courtesy of a Killer Wireless-AC 1535 module that supports transfer rates of up to 867Mbps. The wired and wireless Killer interfaces can be used together via the Killer DoubleShot Pro feature to direct high priority traffic to the fastest interface or they can be combined to create one very high throughput interface. While the name might be familiar - Amp-Up Audio - this motherboard features a brand new high-end onboard audio design. It is based on the familiar Realtek ALC1220 codec, but it has been bolstered by some pretty serious components, like a ESS SABRE 9018K2M DAC, Texas Instruments LME 49720 and OPA1622 OP-AMPs, and WIMA audio capacitors. They have also included Creative's Sound BlasterX 720° audio engine software. As should be pretty clear from the above picture, the X299 AORUS Gaming 9 has been outfitted with a ton of RGB LED lighting zones. There are LEDs between the individual memory slots, on both sides of each of the the PCIe slots, built into the chipset cooler, and there's even LED strips integrated into the I/O and audio section covers. Even the rear I/O shield glows! If that's not enough, there are also three headers on which you can plug LED light strips. Speaking of headers, there are seven fan headers, including three water pump headers, one of which is a high current 3 amp version. Apparently some of these Hybrid Fan headers that can provide up-to-the-second information on flow-rate and water temperature and can be monitored in the Smart Fan 5 software suite. The two onboard temperature sensor headers should also be able to feed data into the utility. The bottom edge of the motherboards features an interesting assortment of power and reset buttons, clear CMOS button, ECO button, OC button, and a Debug LED. Last, but not least, the back of the motherboard is covered by a metal armor plate, which will add structural rigidity and protect the various components, solder points, and traces. The X299 AORUS Gaming 7 is far more similar to the Gaming 9 than it is different. When it comes to expansion slots and storage connectivity everything is exactly the same. The only differences are that two of the three M.2 Thermal Guards are missing, and the M.2 to U.2 adapter is not included in the accessories bundle. The onboard audio features the greatest change, with a swap from the ESS Sabre ES9018K2M to the ES9018Q2Ca and the removal of one of the two op-amps. 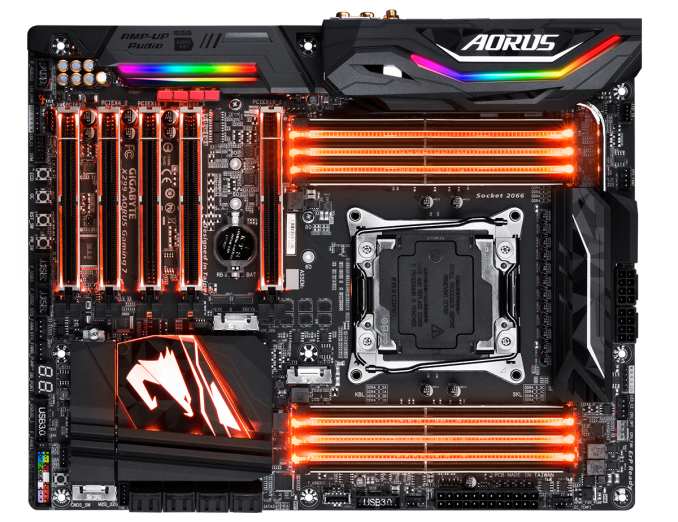 The X299 AORUS Gaming 7 is also missing the fancy glowing I/O shield, though the other RGB FUSION lighting features all remain identical. 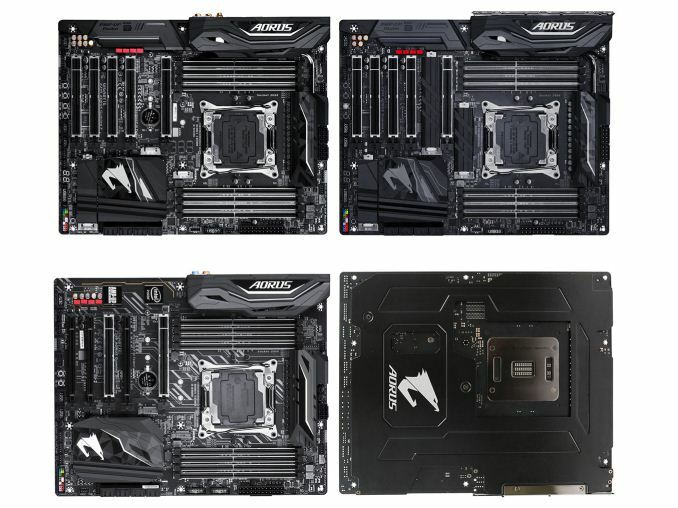 Since there is no Gaming 5 model yet, the step down from the X299 AORUS Gaming 7 to the X299 AORUS Gaming 3 is a little more severe than between the two previous models. Most notably, the Gaming 3 only has one 8-pin CPU/EPS power connector and only two of its PCIe x16 slots are steel-reinforced. The other clear difference is that there is only two M.2 slots - down one from the higher-end models - and there are no M.2 Thermal Guards at all. The USB 3.1 Gen2 front-panel connector has been replaced with a USB 3.0 version, and three of the USB 3.1 Gen2 ports on the rear I/O panel have been replaced by USB 3.0 ports. So in total, this model has four USB 2.0 ports (two headers), ten USB 3.0 ports (six rear, two headers), and two USB 3.1 Gen2 ports (two rear). Speaking of rear I/O, there is only one gigabit LAN port and no Wi-Fi on the X299 AUROS Gaming 3. The onboard audio has also been demoted, with no DAC or op-amps, and no plastic shroud covering that area either. The RGB FUSION lighting feature has also been cut-down a bit, with no LEDs in between the memory slots and only the two primary PCIe x16 slots being lit instead of all five. While we don't yet have any pricing information for any of the models, the GIGABYTE X299 AORUS Gaming series will be available for purchase sometime in June 2017.